Easier said than done for hospitals to disclose a medical error committed by one of its surgeons or nurses, but one doctor suggested that it is one of the many ways, including the use of a surgical checklist, to ensure patient’s safety. Then 60-year-old Pelaprina Sanchez-Carorasan knew something wasn’t right days after she left the hospital for a cyst removal in her hip area. She recalled that after surgery and even after finding out from the results of the biopsy that her cyst was benign, instead of recovery, her condition worsened. She started feeling unwell, was in constant pain, and her hip area grew swollen. She tried seeking different doctors’ help, including a quack doctor, but they all failed to explain and find cure for her lingering illness. Months and years that followed, her surgical wound remained open, became watery and infected that left her bedridden for years. It took her 10 years to feel a strange, itchy object in her hip area. When she scratched it and slowly pulled out an unidentified object, she discovered a piece of rotten gauze coming out from the wound area. Pelaprina decided to go to the hospital to show the gauze and upon the doctor’s advice, she tried to locate the doctor who performed her cyst removal to formally sue him, however, after confrontation denied his hand on it, saying he cannot be blamed for something that had happened 10 years ago as there might have been other factors that affected or caused her condition. It’s been more than 25 years since that medical negligence that changed the life of Pelaprina, who is now 85 years old, but she has managed to stay well and healthy, has even traveled to Sydney, Australia many times and visited different places within the country by the grace of God. The World Alliance for Patient’s Safety in 2015 reported that there are 63 million traumatic surgeries, 10 million pregnancy-related surgeries, and 31 million major surgeries being performed worldwide annually. Apparently, complications after in-patient operations occur in up to 25 percent, crude mortality rate after major surgery is 0.5 to 5 percent, and in industrialized countries, nearly half of all adverse lists in hospitalized patients are related to surgical care. “At last half of the cases in which surgery led to harm are considered preventable and known principles of surgical safety are inconsistently applied even in the most sophisticated setting,” said medical doctor Maximo Simbulan, past president of the Philippine College of Surgeons and founding chair of ASEAN Federation of Surgical Colleges. Simbulan added that the stages of surgical care are not a one-time thing. It is a process and a journey where the patient starts from the preoperative preparation (the diagnosis or identifying of disease), intraoperative (technical expertise of the surgical team), post-operative care, and the follow-up of the disease. “When we are talking about surgical safety, it is really the continuum that starts even before the patient enters the hospital. It starts with the first time you see a patient in the clinic, and it will end until the patient has fully recovered and has visited you for the last time,” said medical doctor Alejandro Dizon, president of the Philippine College of Surgeons. Dizon revealed that the issue on surgical or patient’s safety as a whole is not really new. As early as 1917, there had been advocacies on how to address this by primarily looking at results, best practices, bad results, and even asking hospitals to bring it out on public and compare it for the interest of making it better for the patients, but people view it as a radical thinking and wasn’t warmly received that time. The attention to patient’s safety really started, in what was called the patient’s safety movement, because of a landmark publication in 1999 by the Institute of Medicine in the United States, “To Err is Human”, which brought to the public for the first time the true impact of medical harm and error. “Each year, 44,000 to 98,000 people die in US hospitals not because of their diseases, but as a result of preventable medical errors. The thing is, it’s not about people, it’s not about the people that is the cause, but unfortunately, they are typically blamed especially the ones closest to the incident, but it is because of a faulty system that allows a person to commit a mistake,” Dizon said. Medical errors is defined as the “failure of a planned action to be completed as intended or the use of a wrong plan to achieve an aim”. The errors that can lead to death range from surgical complications that go unrecognized to mix-ups with the doses or types of medication patients receive and can cost about $17 billion to $29 billion per year in hospitals in the US. Dizon shared methods that are currently being employed by St. Luke’s Medical Center – Quezon City to ensure that less post-surgical complications occur, to push for the bigger goal of patient safety. He explained and stressed the need for a “checklist” prior to surgery, which covers the essential items for a smooth procedure. A great example of this, he said, is the World Health Organization Safety Checklist, which covers three phases: the period prior to induction of anesthesia, the period after induction and before surgical incision, and the period during or immediately after wound closure. Confirmation of the completion of tasks per phase is necessary before the procedure moves onward. “It’s easy to blame a nurse who mistakenly administered the wrong medicine or gave multiple doses and tell her it’s her fault. You can [easily] suspend or kick her out. But when you do an in-depth investigation, not focusing on the person, but on the system, it is important to know, what allowed that nurse to commit that mistake?” Dizon emphasized. Dizon suggested looking at some factors such as the environment, area of medication and preparation, the lighting, even the small writings at the medicine bottles. Maybe the nurse wasn’t able to read the instructions properly or maybe she was in a hurry to go home and turn over her duties to another duty nurse that time. “Those are the things that you need to look at. How do you make the work of a nurse better? Some wear a vest when preparing medications that says: ‘Do Not Interrupt Me, I’m preparing a medication’. Or you can enhance the workplace where the nurses are preparing medicines. That’s one example of a simple solution or ways to overcome human errors,” Dizon suggested. Medical doctor Erlinda Oracion, who is the clinical quality director of The Medical City and member of the Philippine Society of Anesthesiologists (PSA), and Philippine representative to the Safety and Quality of Practice Committee of the World Federation, echoed the need for more consistent usage of the surgical checklist, and potentially building comprehensive guidelines for high volume procedures to help focus on successful patient outcomes. Together with fellow PSA member, medical doctor Claudia Rafanan, chairman of the Anesthesia Department of Cebu’s Chong Hua Hospital, Oracion highlighted the importance of responsible use of anesthesia, a drug that causes insensitivity to pain, which allows for a more controlled environment that benefits both the patient and the doctor during surgical procedures. Rafanan afterward shared current practices that have helped the Chong Hua Hospital become an example for other medical center who desire to give their patients the safest and best care possible. She expounded further on anaesthesia, and the right use of muscle relaxants and reversal agents that significantly helped lessen surgical risks during high volume cases such as abdominal procedures. “Surgery should be safe – period. This is the operative environment that patients deserve. 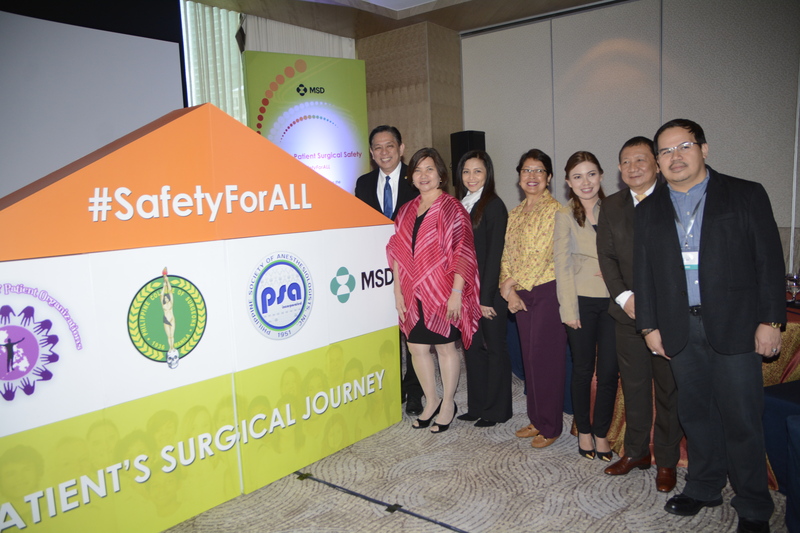 Hence, it is essential that surgery is guided by modern safety principles, open communication, as well as a multi-stakeholder cooperation,” said Maria Fatima Garcia-Lorenzo, president of the Philippine Alliance of Patient Organization (PAPO). “Bottomline is transparency. Because in the end, knowing that it is happening, [then] we have to do something about it. It all boils down to culture. That’s part of the culture – culture of reporting, a culture that encourages one to be brave enough to share,” Dizon said, who shared an incident where they commended a nurse for his admission of a medical error. Upon inventory of medicines, the nurse discovered on his own that he mistakenly gave a patient a multiple dose. When he told the doctors about it, the nurse broke down to tears because instead of being punished, he commended for being honest and telling them about it, at least they can still do something about it. Luckily enough for the nurse, the patient was left unharmed. Dizon admitted it is not easy for the hospital to admit when things go wrong, but that’s part of it. The hospital staff has to acknowledge there’s something wrong and assure the patient and his family that they will work on it or are working on it. “By that approach, we were able to minimize litigations. Sometimes, we have to settle because it’s our fault. But rather than having a long-dragging case in court, 10 years is too short, we are more proactive. But then it is easier said than done. It’s not that easy. We try if we can,” Dizon said. He revealed that their hospital policy is disclosure, but there’s a way of doing it. There should be a sit-down discussion with the patient to let them know, and it should involve the top leadership, particularly the medical director. “Acknowledge, apologize, and look into it. Many times, it proved successful and many times it doesn’t,” Dizon said.